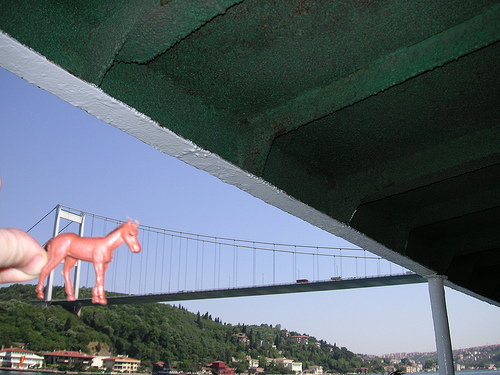 Horses, like cars, are allowed in contemporary Istanbul. Photo “on the bosphorus bridge” by saragoldsmith on flickr. Historically, Istanbul – once known as Constantinople – was a pedestrian city, a far cry from what it has become with its streets (and even its sidewalks!) clogged with cars. Animals, including horses (one of the main modes of transport back then) were not allowed within city borders in order to keep disease at bay and ensure food security. Keeping horses out was, in short, a way of regulating transportation in order to promote the health and well-being of Istanbul’s residents. The only person allowed to ride a horse in the city was the Sultan himself, and later on some of the higher-ups in his service. This is how committed the Sultan was to to keeping the city pedestrian friendly. His solution to the dilemma is also an early example of the ideal scenario urban planners advocate: live close to your work! 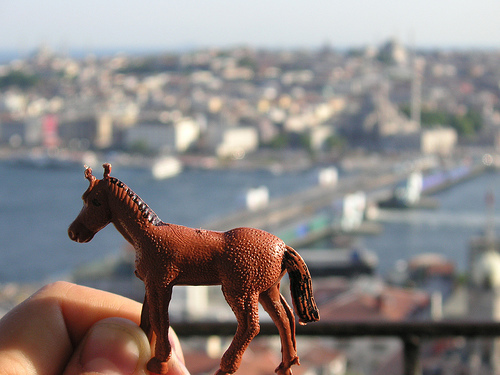 Photo “on the galata tower, looking over the golden horn” by saragoldsmith on flickr.